We all have cell phones in our pockets that are capable of producing exceptional video content, yet many marketers are still hesitant to fully embrace video. 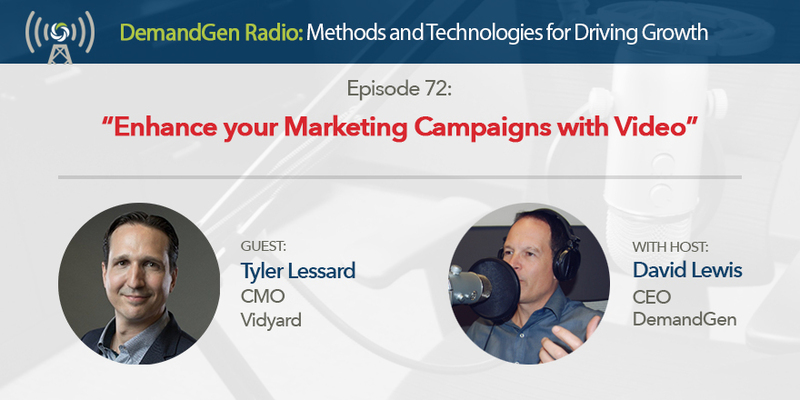 In this episode of DemandGen Radio, Tyler Lesard, CMO of Vidyard, and I talk about the power of video and the effect it can have when it comes to evoking emotionally-charged responses and influencing potential customers to take note of your brand. Video content has proven to be highly engaging and an effective compliment to almost any marketing campaign and producing videos today is now easier and cheaper than ever before. Be sure to listen to the end of this episode as Tyler shares a major announcement regarding a partnership that will make leveraging video even easier for B2B marketers.